The VALCam 8500-630PTZ Professional Camera is simply the most advanced image acquisition solution for Photo ID applications available. A simple double click will center an image in under a second. Unlike other auto cropping systems the results are viewable immediately on your computer screen. This is invaluable for law enforcement applications when documenting scars and tattoos. 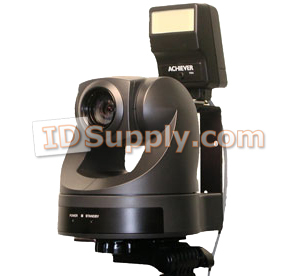 The VALCam professional ID cameraprovides high resolution crystal clear images for consistent quality. High intensity photo-flash provides consistent captures in any lighting environment, even completely dark rooms. Subject distance can range from under 2 feet to greater than 20 ft, unlike digital cameras. The VALCam professional ID camera high end imager matches pvc card printer resolutions for direct printing without scaling or excessive cropping, unlike most digital or web cameras. Once Click Auto Positioning feature. Double click on any subject feature to frame the image in under a second. Click, Drag and Release feature. Position any body part to any position on the screen immediately. Administrative lock on camera controls to increase consistency in imaging. Real-time optical Pan/Tilt and Zoom from the mouse or keyboard. The VALCam professional ID camera provides real-time preview at full resolution on the computer monitor. Frame your shots exactly as they will appear on your card. What You See Is What You Get. Fast captures in under a second without flash, less than 2.5 seconds with flash. Includes twain interface for direct connectivity with all major badging applications. Save images to JPG, BMP or clipboard. Unlimited support is provided through www.VAL.com for the life of the camera. Maximum Load Capacity: 4.5 lbs.